Lately, I have been completely preoccupied with the completion of my Novice station at the alt-qth (Otego, NY). It all started with participation in a vintage rig event last February, the Novice Rig Roundup. Since then I have been obsessing a bit about creating a fully functional Novice station, first by experimenting with refurbishing a transmitter/VFO pair, then the Heathkit HX-1681/HR-1680 twins. Starting with the Radio Act of 1912 amateurs in the US were required to obtain a license. At the outset, there was basically only one license (well, two actually, but the conveyed the same privileges, just different method of application) and all licensees had the same privileges. This license was known as Amateur First Grade in 1912, then became Amateur Class in 1927, then Amateur First Class in 1932. The alternate license in 1912, Amateur Second Grade, allowed applicants who could not get to a Department of Commerce field office to attest to their operating qualifications, and then later be examined by a licensed amateur to become First Grade. This license was renamed Temporary Amateur in 1927. In all cases though, the privileges granted were the same, not a novice in sight. In 1933, the licensing scheme was reorganized by the Federal Radio Commission to comprise Class A, B, and C licenses. Here the first notion of class privilege arrived. Class A licenses got the whole enchilada, and the Amateur First Class licenses were grandfathered into this group. Class B licensees were excluded from certain “reserved radio-telephone bands”. The Class C license roughly corresponded to the old Second Class licenses, with exams performed by other licensed amateurs rather than at a field office, but the existing Second Class licenses were not grandfathered in and had to re-apply because the examination had been made more stringent. The Communications Act of 1934 created the Federal Communications Commission, the FCC we know and love today which replaced the FRC. No change in amateur licensing accompanied this event. The Novice license was a one-year, non-renewable affair, it was upgrade to General or out at the end of the year. In addition, Novice transmitters were required to be crystal controlled, restricting operation to one fixed frequency at a time. This gave rise to an operating style where one would call on the crystal frequency, and then listen up and down the band for a reply on someone else’s crystal frequency, resulting in a full-duplex QSO. All kinds of quaint calling conventions arose to indicate “listening up” or “down 5kc”. I am not up to speed on these, having heard of them but never used them. Post-war surplus crystals in the ham bands were relatively plentiful but considered a big expense for a ham just starting out (usually a teenager with a paper-route budget) giving rise to all sorts of clever techniques for moving the frequencies around a bit. Crystal munging was definitely part of Novice culture. In 1964, the FCC and the ARRL came up with Incentive Licensing, which removed some privilege from existing licensees as an incentive to upgrade. This really annoyed a lot of hams, some of which left the hobby rather than upgrade. The term of the Novice License was extended to two years in 1967, and they lost their 2 meter privileges. In 1977 the power restrictions in the Novice sub-bands were changed when all license classes were granted a maximum of 250 watt output in these bands, and the crystal controlled requirement was removed. (This change is what qualifies my Heathkit gear as a Novice rig.) In 1978, the Novice license was made renewable with a five-year term. As of 2000, no new Novice licenses can be issued, but existing Novice licenses can continue to be renewed. I couldn’t find a precise number, but somewhere around 1% of licensed amateurs continue to hold Novice licenses today. So the 1951 Novice license is the model for the Novice nostalgia genre, with restricted power and crystal controlled transmitters. I’ve tried this kind of operation, and can tell you that it isn’t easy – I have a lot of respect for any op that learned the ropes this way. Thus my intense interest in a vintage station with the frequency agility afforded by a VFO, and how I wound up with my 1977-street legal Novice rig. Centering around the HX-1681/HR-1680 transmitter-receiver twins, I have been building out my station with carefully selected vintage acquisitions, to make a state-of-the-art 1980’s Novice station. Most recently, I have added three pieces of gear. The first is a Heathkit HS-1661 desktop speaker. This unit was made to match the HX/HR twins, and puts out booming audio connected to the HR-1680. Ironically, this is the third HS-1661 I have owned; one I gave to a good friend to use with his HW-16, and the other I sold as part of the package when I sold my HW-16 station. These are really nice speakers – about 5×7 inch oval in a nice metal cabinet, with an impedance of about 4 ohms. They clean up nicely, and are impossible to kill, making them a good bet when one comes up at auction or in the classifieds. The second piece of gear is a Heathkit HM-2140 dual watt-meter. The one I found was in pristine condition, and is working perfectly, not even needing recalibration. They show forward and reflected power (or SWR) on two meter faces, and if you are a SSB op, can read in peak power as well with the addition of a 9v battery. Finally, I decided to add a manual antenna tuner. If you read my last post, you know that I had intended to use an auto tuner with the station, but at the last moment I decided that would just be too anachronistic. I looked at the various Heathkit tuners that were common in the time period: the SA-2040 and SA-2060, but did not find anything that filled the bill. These tuners are all physically large and apparently very robust, and I don’t think people part with them. Those who do seem to want prices that do not seem reasonable to me, so I broadened my search. I was delighted to come across a Cubic Communications ST-3B tuner. I had never heard of this tuner (or company) before, but apparently they were around in the 1980’s and contemporaneous with my Heathkit gear, The reviews I found of this unit were all very enthusiastic. From some additional research, it appears that Cubic Communications made mostly commercial gear, and not much ham stuff, and are still around and kicking today having nothing to do with amateur radio. The unit I found was dirty and scuffed on the outside, but pristine on the inside, and clearly built like a tank. Some work with a Mr. Clear Magic Eraser, and using an ultrasonic cleaner on the knobs, resulted in a very presentable exterior. I will probably paint the cabinet at some point, but it’s fine as is for now. It has two charming features: the capacitors are driven by 6:1 reduction drive verniers, and if you apply 12 vdc, the meters illuminate. With the little red cube logos in each meter, the dials look like illuminated eyes, kinda cute in a spooky way. It really does load up the end fed half wave that I usually use very well. This weekend saw the running of the SKCC Weekend Sprintathon, one of my very favorite operating events, and marked the maiden voyage of my new vintage Heathkit station. I was delighted to discover that I could crank the drive level way down and operate the transmitter stably at 5 watts out, thus combining all of my ham radio favorites: CW, QRP operation, and radios that glow (at least partially) in the dark. Summer is winding down, and a lovely summer it was. I think the weather here in the Northeast was the best I can remember for quite some time. Sure, we had some beastly hot, humid days, but on the whole it was great. A time to play outside, spend time with friends and family, and travel. Not so good for hanging around in a dark basement workshop, building radio gear. Coming into the summer I had been working on a low voltage regen receiver, still a work in progress, and refurbishing the Knight V-44 VFO. The VFO needed lots of work, especially after I destroyed the main tuning coil with the careless application of an electric know (still slapping my forehead over that one.) At the beginning of June I got the coil rebuilt correctly, but was still not happy with the output into the Knight T-60. A friend of mine with access to a spectrum analyzer was going to help me out, but we didn’t get together then, and this became another project waiting for renewed attention. About five years ago I discovered that Heathkit had manufactured kits in the late seventies for a CW transmitter/receiver pair. The receiver was released first, in 1978. All solid state, ham bands only with a switchable narrow filter, LSB/USB/CW, and built-in dial calibration. This was the HR-1680, and it was quite popular from the outset. About two years later, the matching transmitter, the HX-1681 came out. CW only, no WARC bands, the transmitter was a hybrid – mostly solid state but with a tube final consisting of a pair of 6146’s that produced a full 100 watts out on 80 – 10 meters. 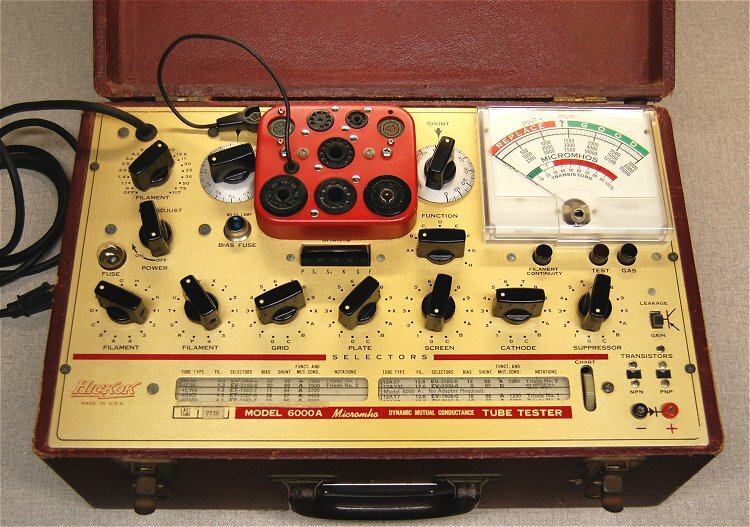 Both units were housed in handsome matching heavy aluminium cases (Heathkit teal, of course) and both sported meters and main tuning dials that glowed red when illuminated. By slaving the receiver to the transmitter, smooth full break-in QSK was possible along with receiver muting and a sidetone. When I first heard of this pair, and researched them a bit I knew I had to have a set as my primary vintage rigs. While the receivers are relatively plentiful in the used market, the transmitters are hard to come by. Perhaps because of the delay in producing the kit, or maybe the CW-only capability, but it is my understanding that the transmitter did not sell well. They are hard to find used. Soon after buying the receiver, I located an auction for a 1681 but had to let it pass for financial reasons. On and off over the last five years I would see one of those transmitters come up on auction or in classifieds, but it was never the right time. Too expensive, or the seller was selling them as a pair and wouldn’t break up the station. It never quite worked out – until this Forth of July. Maybe it was because most folks have more interesting things to do than watching eBay auctions on a big holiday weekend, or maybe the way the listing was worded it didn’t come up on the radar, but during the week leading up to the 4th I found an HX-1681 up for auction at a an extremely attractive price. Cosmetically a 9, and completely untested by the seller who did not have the required big iron power supply. I got the nod from management, and went for it. I won the auction at a very good price, and a week later my beautiful transmitter arrived. Becoming a new owner of an HX-1681 brings new responsibilities. I also did not have the required big iron power supply, and that became the next imperative. The power supply is the Heathkit HP-23, later renamed the PS-23 after Honeywell threatened Heathkit with litigation over the HP mark. Several versions of this supply were made: the HP-23, then PS-23, PS-23A, PS-23B and finally PS-23C. There were minor user interface changes between the models, but basically they all supplied 12 vac for filaments, two plate voltages of 800 and 250 vdc, a negative bias voltage of -130 vdc, chassis ground and a switch line to allow the rig to turn the power supply on and off. These power supplies would work with all of the Heathkit tube rigs, requiring only minor tweaking to match any of the rigs. One used to see these things by the dozens on eBay and on the classifieds, and could usually find them for well under $100, but recently they have become more scarce, and correspondingly more expensive. I shopped around for as long as I could, but the urge to be able to turn on my new transmitter was strong, and I wound up buying one for a little more than I normally would have, had I shopped longer. It was a clear win of instant gratification over common sense. Life is short, eat dessert first. The unit I picked was a PS-23, one of the oldest and simplest models. Later models sport a switch for changing the low plate voltage between 250 and 275 volts. On this model it’s a hardwired change, which seemed to me an advantage – since I only needed the higher voltage, a convenient front panel switch that let you set the wrong voltage didn’t seem that necessary. The unit I selected was not the cheapest around, but the photos showed that it had been recapped with modern plastic and aluminium electrolytic caps. Since the recap kits run about $60, I figured that was one additional expense I could avoid up front. The only real downside was the unit came with a home-made, dodgy looking connecting cable, instead of the usual 8-wire covered cable. Hey, the seller said it worked, what could go wrong? Okay, so the first thing I planned to do, before applying power to the 1681, was to go through the final resistance checks listed in the assembly manual. The manual itself was a bit of a challenge. Several years ago, it was common to find scans of Heathkit manuals online, but at some point someone acquired the intellectual property rights to the manuals, and began assiduously getting them off the web. Today it is difficult to find much more than schematics, and partial manuals online. My 1681 did not come with a manual; all I had was a fragment of the assembly manual that described the resistance and initial voltage checks, alignment and adjustments, and basic operating instructions. Okay, that should be enough to get me going… until I realized that the resistance checks all referred to pictorials to locate test points, and I didn’t have the pictures. I needed to find a manual. There are folks who sell paper facsimile manuals for specific Heathkit gear, and I was starting to look at those offerings, when I stumbled across an auction listing for someone selling a box full of unused Heathkit manuals. The assortment happened to include both the 1680 and 1681, with all diagrams and schematics, as well as manuals for some other toothsome Heathkit gear I don’t own (yet), all for a the price of a single facsimile. I couldn’t pass it up, and within a few days I had the manuals I needed along with the beginnings of a fine Heathkit library. With the manual and pictures in hand, I opened up the 1681 and went through the resistance checks. The checks required verifying that a short to ground did not appear at a particular point, but did not specify the resistances you should see. All the checks passed but I was concerned about one resistance measurement which was about 3 ohms. That seemed awfully close to a short, and I spent about an hour tracing through the schematic before finding a 2.2 ohm resistor between the line and ground. Everything was okay. So I powered up the PS-23, and did a careful check of the voltages supplied at the 11-pin socket. Everything looked good (I had already made the change for the 275 vdc low plate voltage) so I hooked the power cable, and turned on the 1681. The beautiful dial lights lit up red, and I immediately noticed a sizzling sound coming from the dodgy home-made cable. I don’t know about you, but when I hear sizzling sounds coming from a cable carrying more voltage than the third rail of the New York City Subway on one of the wires, I think “Abort! Abort!” That was the end of Voltage Test 1. Happily, there did not appear to be any damage to the rig or the power supply. Magic smoke intact, it was time to find a replacement cable. Back to eBay, where there are perennial offers of a pair of 11-pin sockets and a six-foot length of 8-wire cable (this turns out to be a WireMan product BTW) which includes a helpful scan of the wiring instructions from the PS-23 manual. Assembling the cable was straightforward, and in short order I had a correctly wired, non-sizzling power cable for the HX-1681. The initial voltage tests passed. This was the exciting moment, the first time I would try to load up the transmitter. Following the tune up instructions, I placed all the controls in the correct settings, and took the first step. Placing the meter in Ip position, and switching the mode switch to Tune, I should see the meter point to an indicator mark showing the correct idling plate current….. Nothing. Nada. No meter deflection. Arrrrrrrrrrrrgggh! Okay. I powered everything down, and gave this development a little thought. The easiest thing to check would be the tubes in the final. One 12BY7A and two 6146‘s. I pulled the tubes and tested them on my Hickok 6000a tester – they were perfectly fine, happy little tubes. That wasn’t it. In thinking over what I had already checked, I realized there was one resistance measurement I had not bothered to make. There was a footnote in the resistance check instructions that that stated with the meter in the Ip position, and the mode switch in the Spot position, one of the outputs from the VFO should be at ground. I had not checked this, since most of the resistance checks were to insure that there was not a short to ground at the test point. I made the neglected test, and instead of a short to ground, I had an open – infinite resistance. There was something wrong with the switch! Pulling out my trusty can of Radio Shack Control/Contact Cleaner and Lubricant, I went after all the switches and pots in the rig. My technique is the nest each control in a wad of paper towelling on all sides, and then literally blast the crap out of it while moving the control through its entire range repeatedly. This cleaner foams up a la Scrubbing Bubbles for electronics, and I have had good success with it before. The key is to be sure to mop up any excess; let the control sit for while and then wipe it down again. It’s a good idea to check the next day for any residue which may have seeped out. After the control cleaning exercise, everything worked fine. The plate idle current looked a tad low, so I adjusted it according to the manual, and after that the meter indication was spot on. I did not re-neutralize the tubes or realign the output, and these steps did not appear to be necessary. After figuring that out, there was one more small issue to deal with. The HX-1681 manual describes a simple mod to the HR-1680 receiver to better match audio levels for the sidetone produced by the transmitter. This involved changing a 33k ohm resistor on the audio board of the receiver for a 100k Ohm value, and adding a 10k ohm resistor in series with one on the audio lines to the volume control. I found both these resistor values in our local RadioShack in Oneonta NY, and made the change “in the field” so to speak, as the receiver was already at my upstate QTH. I was ready to install and test the transmitter with its companion 1680. I needed three shielded male-male RCA phono plug cables to connect receiver mute, sidetone, and receive antenna. Although the manual calls for coax with phono plugs to connect the receive antenna, the shielded audio cable (also from RadioShack) seems to work fine; I’ll replace it with coax if I notice any problems. The initial tune-up into a dummy load went well, but I was a little disappointed to hear hum in the audio out when the transmitter was keyed. On a hunch, I grounded the transmitter and receiver chassis together, and the hum disappeared. My habit is to use an end fed half wave antenna cut for 40 meters, with a 4:1 balun and a manual antenna tuner at the upstate QTH. This works fine with my modern solid state rigs, but the setup is a bit cumbersome for use with output tank of the a tube transmitter. There is a concern that there might be harmonics in the output that are stronger than the current FCC regulations allow; these are more stringent now than when these tube transmitters roamed the earth. Using a resonant antenna is best, but a tuner also helps clean up the signal. Here’s my solution to this conundrum (since I really can’t set up a resonant antenna given the configuration of my upstate shack): I load up the transmitter into a resonant dummy load, back off the plate current a lot, then switch to an auto-tuner connected to whatever antenna configuration I have set up. When all the chatter subsides, the auto-tuner has got my “random wire” looking as resonant as it’s going to get. I can then bring up the transmitter power and tweak the tank. The perfect fusion of retro and space age technology. With everything installed and working, it turned out that propagation was not great that weekend with minor magnetic storms going on. I did see my signal in RBN, so I know I’m getting out. There just wasn’t enough time that weekend to make a QSO though. There will be some further embellishments on this station in the coming months, but I’m pretty excited. There are lots of retro radio events coming up: Straight Key Night, Novice Rig Roundup, the Classic Exchange and others. I am really looking forward to putting my twins through their paces. This past January, I became aware of a new event celebrating the vintage rigs popular in the 50’s, 60’s and 70’s, the Novice Rig Roundup. I love the tube rigs from that era, and absolutely had to put together a station and join in. I already had on hand a few transmitters capable of the job: two QRP 2-tube rigs based on a classic MOPA circuit (you can find links to several on this page), and a Knight T-60 kit built transmitter. The T-60 was particularly appropriate, as it was designed to operate at less that 75 watts input, making it the perfect Novice transmitter. I operated all of these transmitters under crystal control, and after a week of trying to make contacts, gained real respect for those ops that learned the ropes that way. For someone who was licensed well after solid state transceivers were the norm, operating a separate transmitter and receiver, constrained to a single frequency, was a real challenge. Back in the day, ops would call on their crystal frequency, and then listen up and down the band for a reply. In the modern world of automatic zero-beating and narrow passband filters, being stuck on one frequency just doesn’t work all that well. After a week of not too much success, I was determined to add a VFO to my vintage station. Operating with a separate VFO, in addition to a transmitter and receiver, does complicate things a bit. Adding the VFO to this mix increases the complexity a bit, because of some of the characteristics of VFO operation. Unlike a crystal oscillator, which does not provide a signal until the transmitter is keyed, a separate VFO can run and be keyed independently of the transmitter. The VFO can run continuously, or be keyed on and off in synchronization with the transmitter. Both methods offer advantages and disadvantages. Allowing the VFO run continuously, and just keying the transmitter, will undoubtedly produce the most stable oscillation. The VFO will drift less, and show no start-up instability on each keyed Morse element. However, there is an odd side-effect to this mode of operation: something that was known as “backwave” back in the day. Suppose you hear a signal in your receiver and want to reply, by tuning your transmit frequency match exactly (this is called “zero-beating” the signal.) With the VFO running, you will hear your oscillator in your receiver (if it is not muted) and the tone, the backwave, will blot out his signal. You won’t hear him. Also, if you are relying on listening for your transmitter in the receiver while keying as way of providing a sidetone, the backwave will either obliterate your keying, or make it sound weird. So all in all, the “let it run all the time” approach is not too desirable. The alternate approach, that of keying the VFO in synch with the transmitter, is the one that was most often used. In this scenario, the VFO running only during the times you are actually transmitting a Morse element – sounds ideal, right? Except there is an issue that arises in this case: chirp. The VFO, when transitioning from off to stable running can exhibit slewing of the frequency. This “bird-whistle” effect is called chirp, and is the hallmark of a poorly run station. Operators would attach a “C” to your RST signal report to indicate there was chirp on your signal, and if it was really bad and you were noticed by an Official Observer (OO) station, you could be the recipient of a dreaded “pink slip” notification to clean up your act. Chirp on your signal is to be avoided at all costs. I’ve had some direct experience with this phenomenon. I had a Heathkit HW-16 transceiver coupled with a HG-10 VFO. The thing chirped like a cage of finches. It was one of the reasons I finally sold the rig. There are a few things that can be done to minimize or eliminate chirp with synchronized keying. One is to run the VFO on its own power supply. Another is to allow the VFO to stabilize before keying the transmitter, and to un-key the transmitter before the VFO. Some tricky timing is required. This approach was first explored in tube circuits in the 1950s, and paved the way for modern transceivers with internal T-R switching. Living in the 21st century and having access to cheap and efficient microcomputers, it is easy to shift the keying into the future, by introducing delays between keying the VFO and the transmitter. This is the idea behind my VFO-friendly switching system, the T-R Time Machine. The external event of closing the code key drives a chain of events that put the signal on the air lagging the keying by a few milliseconds, but always keying the transmitter only when the VFO is in stable oscillation. The sequencing works slightly differently depending on whether you want to be able to hear signals between the elements of your sending. This mode, called QSK (one of those Morse code signals meaning “I can hear you if you interrupt”), will wind up transiting between transmitting and receiving several times a second as you send. Non-QSK mode (for want of a better term,) keys flips the antenna and keys up the VFO, and leaves you in that state while you send. The station remains in transmit mode for a fixed “hang time” after the last Morse element sent, before flipping back to receiving. The T-R Time Machine can manage either mode. In non-QSK mode, the T-R Time Machine starts the VFO, delays a couple of milliseconds, and then starts keying the transmitter in time with the external keying. The VFO runs continuously, but the receiver is muted so you do not hear the backwave. After the hang time has elapsed since the last keyed Morse element, the station is sequenced back to receiving. The hang time is set to be just a bit longer than the typical pause between phrases, to minimize the amount of switching. The first morse element is robbed of a millisecond or so of duration, but at 25 WPM that amounts to about 3% shorter, and only the first transmitted element is affected. It is completely unnoticeable on the air. QSK mode time-shifts your keying by a couple of milliseconds, so the keying the transmitter lags the keying input. On key up, the VFO runs for a millisecond or so past the unkeying of the transmitter. The effect is to slow the output keying very slightly, but again it is unnoticeable on the air. My Arduino sketch re-uses some code I had written for the Digital Fist Recorder project, but adds a new concept to control the keying: a coding device called a Finite State Machine. Using this approach, you model the process as a series of states. Each state performs some logic on entry, and based on current conditions, decides how to transition to the next state. Organizing the code this way makes it very easy to maintain. The switching tasks, things like key down, VFO start, transmitter start, etc. lend themselves nicely to representation in the code as discrete states, and the resulting code is quite clear to follow. I have not yet posted the code to GitHub, but intend to do so, and will post an update here when it is availble. As always I am releasing this code as open source under a GPL license. Building the TRTM naturally divided into to two phases: the easy part and the hard part. In addition, there are two voltage regulators which I built using ICs and Manhattan style assembly. One regulator drops the input voltage to a regulated 9 VDC to run the Arduino. The second provides a regulated 5 VDC to run the relay board and the Key-All modules. In early prototypes of the TRTM I ran into difficulties sourcing enough current from the Arduino to run the outboard switching components; this version sidesteps the issue. An additional feature in the latest enclosure is the complete isolation of the switching circuit from the Arduino, to avoid RF feeding back into the computer and causing issues. I accomplished this by mounting all of the switching connections (the antenna and phono jacks) on a panel made of polycarbonate plastic. This material is inexpensive, and easily machined with ordinary hand tools. The plastic plate is mounted on the back panel of the aluminum enclosure through oversized holes, so the switched grounds are completely isolated from the enclosure ground. Actual switching isolation is provided by the use of relays, and the Key-All units which are opto-isolated from the control circuits. It plagued me for weeks, until I finally sat down and carefully stepped through the code to discover that I had never initialized the digital pins used for the LEDs as output pins in my sketch. Silly code bug, but it really drove me nuts. I am always a little surprised at the constant learning experience afforded by this hobby. My assumptions are usually incorrect, but the discovery of what is actually going on is always entertaining and instructive. Consider the story of the two VFOs. At the end of my last post, I was pretty convinced that my refurbished HG-10 VFO was not going to cut it in my Novice tube station. The station was keying oddly, with transmitter output wandering up and down, although the output from the VFO was steady. At this point, I was keying the VFO and the transmitter simultaneously, using the old two diode trick. I had more ambitious plans about keying, but this comes a bit later on in the story. About the same time as the discovery of weird transmitter keying (by the way, the T-60 is totally well-behaved when using a crystal instead of the VFO), I happened across an eBay listing, only hours old, for a Knight V-44 VFO in good condition. This, if I haven’t already mentioned, was the VFO that sparked all this VFO interest. I had seen one at auction that went for a really silly, high bid. That’s when I started looking for HG-10s. Anyway I jumped on the V-44 at its very reasonable price, and sat back waiting for its arrival. During that wait, I got my hands on some V-44 documentation, and studied up. The v-44 has a self-contained high voltage power supply, and uses a really clever design of putting the power supply at the top of case, with the tuned circuits below, so the heat from the supply won’t add to thermal drift. This gives the cabinet a kind of cool “portrait” rather than “landscape” aspect ratio. It’s rather charming. three-wire cord, with chassis ground and an inline fuse. This was not too tall an order, and while the VFO was still in transit from its former owner I ordered and received the necessary cap from Mouser. I was all set. The timing of the arrival of the V-44 was about a week before I would be traveling to the upstate QTH (site of the novice station) for about ten days. During this time I would be there on my own, leaving plenty of time for ham radio adventures. So it seemed really important to get the repairs done before this trip. Really, really important. Of course, there was always the normal myriad of responsibilities: family, work, social… so it seemed that bench time was a scarce commodity during this lead up to the trip. I allowed myself to fall victim to the worst (and possibly most dangerous, but happily not in this case) foible that affects amateurs of any stripe: I rushed the job. Big mistake. RG-174, which made room for the new 3-wire power cord without needing a new hole in the chassis. Adding the in line fuse was not a problem either, there was enough room in the under chassis to squeeze it all in. The problem arose when I looked for a convenient stud to attach the third grounding wire. There wasn’t any. Now it’s close to 11:00 PM on a week night, getting near bedtime, but if I could button up this cord replacement, I could take the VFO upstairs, plug it in and just give a listen. I was so close… Okay, no problem, I’ll just drill a 1/8th inch hole in the chassis, put a bolt and nut in, and Bob’s your uncle – chassis grounding. Without giving it much thought, (obviously) I chucked in a bit and started drilling. These old boat anchors are built tough, no flimsy soft aluminium chassis here – nope this was good heavy gauge steel and it was taking some effort to get through. I was putting some pressure on the bit, and just as some part of my hindbrain was screaming “No, no lighten up your going to pop through…” suddenly the bit popped through. Right into the main tuning tank coil. In that instant, the thought that I should have put a little wood block in there behind the hole (there was ample room) flashed through my head, way too late to be useful. I think I said “oh, darn” loudly a few times. Maybe that wasn’t exactly what I said. I surveyed the damage. It was pretty bad, but not cataclysmic. If I had shattered the coil form, it would have been game over, but all I had accomplished was to destroy the windings. This, I thought, could possibly be fixed. I went to bed. The next day, I pondered my options. Obviously, all I had to do was wind a new coil on the ceramic form, with the same inductance as the one I had destroyed. No problem, I’ve wound lots of coils. I just had to look up the inductance of the main tank coil in the manual. Every coil in the circuit was called out by value in the parts list except the main tank coil. It was just referred to as Knight Kit part number 152014, “coil, oscillator, tank”. Okay, this wasn’t going to be that easy, but I wasn’t about to admit that I had murdered my beautiful VFO with a power drill. I’ll just count the turns, and compute the inductance. There then ensued over the next day or so a great deal of careful, methodical turn counting. Of course, with roughly 30 gauge wire, and a chunk of the wire actually missing (bits were cut by the drill and fell off) it was actually impossible to get an accurate count. I even tried taking a macro photo of the damaged coil, and using a photo editor putting little tick marks on the image every ten turns so I wouldn’t lose count. In the end I had an estimate plus or minus 5 turns, not quite close enough for engineering work, as they say. Okay, plan B occurred to me. The dial calibration instructions called for adjusting two trimmer caps separately, one for 80 meters, and one for 40 meters and up. This meant that the tank coil, which was obviously a fixed inductance, had to resonate the main tuning capacitor plus the each trimmer at two different frequencies, which are known. Since the trimmer caps are identical, I just had to find an inductance that could resonate both frequencies within the range of the trimmers, with the main cap set at the calibration point. I then embarked on a course of feverish calculation: inductance by wire diameter by gauge and number of turns, resonant frequency at various values of capacitance – finally I zeroed in on the target value, and I started to wind my new coil. I use the penny and quarter technique. I laid out 10 pennies in a row, and 8 quarters (I needed 81 turns total). After winding each turn, I moved a penny to a new location on the table, gradually building a new row. When ten pennies were moved, I moved a quarter to represent 10 turns. Lather, rinse, repeat. It’s a foolproof method of guaranteeing that you don’t mis-count, and it only costs $2.10. But alas, I did not nail it on the first try. Two thirds of the way through, I was running out of room on the coil, and realized I had used the wrong, too large, wire gauge. Okay, start again with the right gauge, only to run out of room again. Re-compute number of turns for smaller gauge wire and start again. Lather, rinse, repeat. Finally my coil was done, but there was another nagging issue. The original coil had been treated with an application of “coil dope”, a thin varnish. Reading on the web seemed to indicate that using coil dope was a good idea, especially in oscillator circuits, as it minimizes drift by stabilizing the turns of wire against movement or vibration. But where to get some? You can buy it mail order, but it is expensive and I didn’t want to wait. So I looked for recipes of home-brew coil dope and discovered that it is dead easy to make. Smelly, inconvenient, and extraordinarily flammable, but easy. You make coil dope by dissolving styrofoam packing peanuts in toluene. Toluene is a highly volatile, flammable, toxic and generally nasty solvent use as paint thinner, which can be had at any hardware store in inconveniently enormous quantities. I needed about an ounce, and was only able to find it in a gallon container. At this point, I’m all set with regard to future toluene needs. The packing peanuts are easy, right? I mean one always has scads of the things from incoming packages in boxes in the basement. Right? Well, we had recently recycled every last one of the little buggers at the local retail shipping store, there was not one to be had on the premises. I had to wait until I got to work the next day to get some at the office. Sensibly, our IT guy has never thrown out a styrofoam peanut since we moved into that office space. You never know when you will need some. Making the coil dope was done outside, despite the still chilly late winter temperatures, and even at that I nearly passed out from the toluene fumes. But finally, after dissolving an amazing number of peanuts in two ounces of toluene, I was rewarded with a maple-syrup-like consistency, evil-smelling fluid. Voila, coil dope! Using a cotton swab, I covered the coil in a light coating which dried in seconds, and looked pretty official when it was all done. And I still have 2 ounces – 1.5 milliliters of coil dope left for future endeavors. The finished coil popped right back in place and I quickly soldered back the two connections. I went through the calibration procedure, and everything seemed okay, but the story wasn’t over yet. I took the VFO on my trip to the upstate QTH on schedule the following weekend, and installed it in the Novice station. It looked good, and I fired it up on 80 meters. I was using the technique where you turn the VFO on (not keyed) and key the transmitter. This gives rise to a phenomenon called “backwave”; if your receiver is not muted you hear the VFO tone behind the sound of your keying. It sounds odd, faintly disturbing, like listening to the receiver with it and your head in a garbage can – but I was determined. A little tune up, and a couple of quick CQs. Not hearing any response I headed off to the computer to check Reverse Beacon Network, to see where I was heard. Okay, lots of stations were picking me up on 80 meters, definitely a good start. Next, on to 40. I tuned everything up on 40, and gave it a go. Lots of good reports on 40. And, lots of good reports on 80. What? Yes, it looks like I was a candidate for the Worked All Bands Simultaneously award. Definitely not a good thing. Subsequent tests with a dummy load showed that I was getting strong sub-harmonic signals that were getting through the output tank in the transmitter. Not a good thing at all. I knew that the oscillator in the V-44 generates strong harmonics from two fundamental frequencies: a 160 meter band fundamental generates the first harmonic which provides 80 meters, and an 80 meter band fundamental provides harmonics used for 40 meters and up. Something was definitely out of kilter, perhaps output filtering, which looks kind sketchy from the schematic, or maybe my home-brew tank coil resonating someplace it shouldn’t. More research is needed, but for now sadly the V-44 is on the bench. In light of this revelation, I went back to playing with the HG-10, and in doing so made a remarkable discovery. If you don’t use fancy two-diode keying arrangements, the HG-10 works fine with the Knight T-60. Take away the diodes from the keying circuit, and the funky instability goes away. I know from prior experience that the T-60 is notoriously hard to key with anything other than a plain key that shorts to ground. It has a fairly large dropping resistor in the keying circuit, which has the advantage of presenting a low DC voltage to the key when it is open, removing any shock hazard. The downside of this arrangement is that if there is any significant resistance in the key, the rig won’t key. (I had this happen with a soviet military key, which had 20 ohms resistance internally in some kind of built in filter.) And apparently, the T-60 doesn’t like diodes in its path to ground. With a regular key, the HG-10 drove the T-60 perfectly well, I was mistaken in the assumption that the low drive was at fault. The HG-10 is now part of the Novice station, and the V-44 is back in the shipping box, awaiting further diagnosis to figure out the weird sub-harmonic behavior. I may re-visit the winding of the tank coil. I may find a “for parts” V-44 and replace my homebrew coil with a real one. But for now the V-44 is sidelined and the humble HG-10 is doing the job. The saga I am about to recount is too involved for a single blog post, so this is part one of two. After enjoying a month of the SKCC K3Y operating event in January, I was really excited to learn of a new event, only in its second year, that took place the last week of February. The Novice Rig Roundup, a week-long exercise in operating those beloved, chirpy, antique rigs of our childhood, was just too appealing to me to pass up. Granted, I never had any of those rosy experiences to wax nostalgic about, as I wasn’t licensed until middle age, and then firmly in the solid state era. I never held a Novice license, but I really do like those old tube rigs, and so enthusiastically dived in. I had decided to operate QRP, using either of the two homebrew MOPA transmitters in my arsenal. I have two QTHs, and one QRP tube rig at each location: the W1TS Simple Transmitter at one, and the QRP Blowtorch at the other. I also have a classic “Novice” transmitter, a Knight T-60, which operates QRO at about 40 watts out; at 60 watts input it definitely would have qualified for use by a 1960’s Novice. It turns out the third week of February was very busy for me with only a little operating time available, and I managed a total of two (yes, only two) contacts over the entire time. And, one of those was with the T-60, as I abandoned my normal QRP operations for some serious muscle. Both QSOs I made were with folks who happened to be calling on my crystal frequency. I know that in the good old days, hams would call on their transmitter frequency, and then listen up and down the band for a reply. QSOs were full-duplex, on two frequencies. With modern transceivers, this practice is long gone. We are all used to carrying out our conversations in half duplex on a single frequency, often with narrow bandpass filters engaged. It is possible to reply to a calling station only a few hundred Hertz off, and never get heard – believe me, I know. So although I had fun, and am looking forward to next years NRR event, I found myself yearning for a VFO. I had at one time an external VFO setup – a Heathkit HW-16 transmitter/receiver, paired with a Heathkit HG-10 VFO. I never really liked using the HW-16 with the VFO. It chirped like crazy; I recall making one QSO with it that I cut short after a few overs because the thing was chirping so badly. Eventually I sold the HW-16, and the VFO with it. I have read that the HG-10 was more prone to chirp when it is powered from the transmitter. There is also a problem with keying the VFO and the transmitter simultaneously, as there is a little key-up instability in the VFO. So I had all of this in mind as I started to look for a VFO for my station. The Heathkit HG-10s are readily available on eBay – at any given moment there are at least two at auction. I would certainly prefer to find something else, but those HG-10s are out there, and because they are so plentiful, the prices remain relatively low (for eBay, anyway.) While searching the classifieds and eBay, I came across a Knight kit V-44 VFO. This is the companion to my T-60, so naturally I was very interested. After researching the V-44, I was even more interested, as the engineering looked pretty good. Unfortunately, several folks were bidding on that unit, and the price went nuts. It sold for about four times what I was willing to pay, not including hefty shipping. Back to searching for an HG-10. I quickly found one that looked functional, but not super-good cosmetically, for a reasonable price. While I was waiting for it to arrive, I decided to build a standalone power supply for it, trying to head off the chirping. Also, a standalone supply would allow me to use it with any rig. Back when Radio Shack was last going out of business and closing stores, I picked up a pair of robust filament transformers on clearance for just a few dollars each. I knew you could use these, back to back, to create a 120v isolation transformer. The HG-10 documentation describes a simple, non-regulated high voltage supply that can be used to power the VFO, based on a single isolation transformer. The time had come to use those filament transformers; I built the PSU. It is a simple half-wave rectifier design, with two filter caps. I added a three prong grounded plug, and a bleeder resistor across each filter cap. Once the HG-10 arrived, it was time to open it up and check it out. Wiring job looked okay, and I could tell that the unit was configured for grid block keying via pin 8 of the octal plug. This is a very common configuration for these units, as this was the setup needed to connect an HW-60 or HW-16 transmitter. I wanted cathode keying, since the keying would not be provided by my transmitter. This involved removing a jumper, moving a connection from the octal socket, and changing a resistor. All of this is well documented in the HG-10 manual, which can be found from many sources on the web. Since I was powering my unit from its own PSU, I had to add a dropping resistor ahead of the 0B2 regulator tube – again the manual provided a graph for computing the value needed, and I guesstimated I’d need a 1 watt 1k resistor based on the 160 volts I measured from my PSU. While the Heathkit memo suggested replacement with a larger value choke, apparently the folk remedy for the problem is to swap the cathode choke (1 mH, too large) for the plate choke (200 uH, too small). The smaller choke works fine in the cathode circuit. Instant fix, without having to track down hard to find antique parts. After making this change, the 80m output looked much better. With all these changes made, and the PSU I was ready to go. A rough measurement of the output from the HG-10 showed about 7v out at 80 meters, and about half that on 40 and above. The unit nominally produces about 5v out, so these seemed about ballpark. Finally, hooked the VFO up to my W1TS Simple Transmitter, tuned up and… really low output. Slightly better on 80 than on 40, but not really enough to be useful. The output was just too low. The following week, I tried it with the T-60. On 80, I was able to tune up the transmitter, but on 40 it was just not stable, the signal would jump up, then drop, then come back. I think there just isn’t enough output from HG-10 to drive any of my transmitters. So quite a bit of work, a lovely, working VFO, but the wrong one for my purposes. I am still rockbound. But then, an amazing bit of luck which I will tell you about in part 2. We’ve had the first snow of 2016, and it was a doozy. “Winter Storm Jonas“, as it was named in the media, was a nor’easter that roared up the east coast dropping record amounts of snow. We got our share, but being north of the storm track, not so much as to be catastrophic. A solid foot and a half of light powder, easily shoveled, no big deal really. Most importantly, even though we had some serious gusts, my new mast survived the storm handily, and my antenna is still in operation. Quite a relief, actually. The arrival of the storm did have an impact on how we spent the weekend. Planned travel was cancelled, bread, milk, extra cat and dog food purchased, and we hunkered down to enjoy a quiet snowy weekend. Aside from occasional forays out to clean off the cars and the front steps, we were all left pretty much to our own devices. Ah, blissful unstructured time! I had been planning to start the construction of my first space charge tube regen – the unexpected down time seemed ideal. Unfortunately, I was not as well prepared as I thought. I’ve decided to build this first version using a wooden “orange crate” construction, with thin slats and solid ends; spaces between the slats will accommodate the tube sockets. I figure this will give me some wiggle room as I lay out the circuits, without the profound emotional commitment demanded by making holes in an expensive aluminum chassis. Earlier in the week I had raided Home Depot to find nice oak slats and boards to build my crate, I was all ready to go. The first step was to determine length of the end boards by laying out the slats and tube sockets. Oh drat! No sockets! I thought I had sufficient sockets left over from the construction of the W1TS Simple Transmitter, but as it turns out, the ceramic sockets I had left can’t be mounted easily between slats. The fiber kind, with a molded-in metallic ring is the type I need. Not a one remained. Also, an inventory of variable caps came up short. The nice 150 pF one I had intended to use got drafted into my crystal receiver, and a rummage through my box of variable caps failed to turn up a replacement. I was seriously unprepared. These shortcomings could be easily be remedied by a trip to eBay or Antique Radio Supply, but that would not help me this weekend. No, no regen this weekend. There was plenty else to do, shovelling, operating, catching up on correspondence and paperwork, but I really was in the mood to play at the bench a bit as well. As I have been listening with the crystal receiver quite a bit in the evenings, I thought it might be a candidate for some improvements. I have been using alligator clip leads for the antenna, ground, and headphone connections, and this is less than ideal. The signals would suddenly disappear as I jogged one lead or another – very makeshift. And I really have been listening to broadcast AM with this radio. You can actually DX broadcast AM with it – I heard WFED AM (1500 kHz) from Washington DC quite clearly the other evening. It’s sort of ironic, I never listen to broadcast AM with any of the “real” radios I own, but I am delighted to sit through auto parts store commercials when they are captured with just a coil and a diode. Anyway, some improvements were definitely in order, and I just recently came into possession of an interesting new glue, that seemed to be ideal for the tasks at hand. In conversation a while back, my sister-in-law mentioned this new glue that she had heard about, but not tried yet. It is cured with UV light, sets in about 4 seconds, and has very high bond strength. It was one of those “as seen on TV” things; we don’t watch the right TV apparently, I had never heard of it, other than the stuff the dentist uses to make those costly repairs in your mouth. She had bought some on Amazon. Intrigued, I asked for a link on Amazon, and she responded by saying she’d drop the glue off with me – I could try it and let her know how well it worked. Sounded good to me. Reading the package, I came away with a somewhat mixed impression, as the glue was described as “safe and non-toxic” but the instructions suggested gloves and goggles for handling, and a quick call to 911 before abandoning all hope should you accidentally ingest the stuff or get it in your eye. I decided to take the route of full protective gear, and I threw in a pair of UV goggles for good measure; I’m completely paranoid about cataracts. not very strong, and would pop off the first time I connected a cable. This is exactly the kind of challenge that UV glue excels at. It has almost no “sticktion” – you can’t put a dab down, place parts together, and let go. They will simply fall apart. But if you can hold the parts in place and hit it with the UV light, 3 to 4 seconds later, the stuff is rock hard. No tackiness at all. And perfectly clear. The glue is a fairly stiff gel, pretty much stays where you put it, but it will start to run under its own weight after a few seconds. It works best were you can use it to fill a void, by applying several applications and curing each one. I laid down a bead of glue, held the connector in place, and zapped it. Wow, instantly rock hard. I filled the voids and zapped again. Immediately I had a connector that would stand up to attaching and removing the antenna cable, no problem. Pretty amazing. The glue cures clear and glossy, and is very hard to see, but it does fluoresce brightly under the UV light, so you can see clearly where it is. Next, I wanted to add a socket for the 1/4 inch mono plug on the end of my high-Z headphones. I had scavenged such a socket from a ham fest special I am parting-out, but it was the kind that mounts in a 3/8 inch panel hole. No panel, what to do? I made a little mini-panel out of single-sided PCB material, soldered to make an “L” shape with a second piece. Using the UV glue, I cemented the bottom of the “L” to the underside of the board, and then filled in the voids on both the top and bottom with additional glue passes. Again, rock solid, and luckily so, as considerable force is necessary to plug in or remove the phones. Another instant success. By this point I had dispensed with the gloves. This stuff is easy to control using the applicator squeeze bottle; unless you expect to really have to tussle with the job at hand the gloves probably aren’t all the necessary. But I’m standing by the UV goggles – you can’t be too careful when your eyes are concerned. The receiver was working at top form, but it seemed to be lacking something. An aesthetic improvement perhaps? Armed with this amazing glue, I faced the rampant desire to glue more stuff to this radio. My wife maintains an art studio on our property, she is primarily a painter, but creates puppet shows, writes and illustrates children’s books, and often creates small assemblages and sculptural works. Suffice it to say that her studio contains a wealth of odds and ends, and she is very generous with her materials when it comes to decorating radio projects. I think she feels that they are under-decorated in general, and will do what she can to correct that unfortunate state. I asked for, and was graciously granted, two “frozen charlottes” from her collection. These small doll figurines date from the Victorian era, and were very popular toys for children. There are lots of internet material on them, you can look it up. Several years ago, when we first set up her studio, I had found a huge bunch of them from Germany on eBay, and given them to her as a “studio warming” gift. We might have the definitive collection in the northeast. I thought that two charlottes, representing the etherial spirits, fixed at either end of the coil tube would not only be attractive, but enhance the operation of the receiver. Frozen charlotte, guarding the entrance to the coil. Unfortunately, I did not make quantitative, before and after measurements of signal strength, so this report needs to be considered anecdotal at best – however I swear those French-speaking callers were at least a half S-unit stronger after applying the figures. And I love the way it looks. Get this glue away from me, before I really hurt myself.